Ion channels are pore-forming proteins. It is a passive transport pathway for various inorganic ions across the membrane and an important way for living cells to carry out metabolic activities and material exchange. Ion channels regulate the entry and exit of corresponding substances through the opening and closing of ion channels, which is of great significance for the realization of various functions of cells. Almost all cellular processes depend on ion channels. In 1990, American scholar Fontaine et al. first reported that there might be genetic mutations in voltage-dependent sodium channel alpha subunits in skeletal muscle membranes of patients with hyperkalemic periodic paralysis (Hypp), which initiated the research on ion channel disease. In 1991, two German scientists, Erwin Nell and Bert Zachman, received the Nobel Prize in Physiology for discovering intracellular ion channels and pioneering patch clamp techniques. In 1998, the resolution of K+ ion channel structure . In 2002, the resolution of the Cl- ion channel structure . 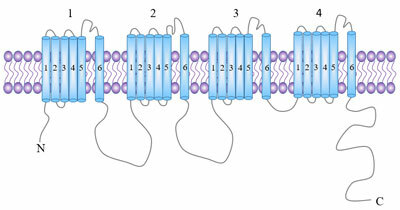 In 2011, the resolution of the Na+ ion channel structure . These studies have greatly improved the understanding of the structural basis behind the ion channel function. Biofilms can transport inorganic ions across membranes in two ways: passive transport (cis-ion concentration gradient) and active transport (inverse ion concentration gradient).The channel of passive transport is called ion channel, and the ion carrier of active transport is called ion pump. According to the selectivity of the channel to the ion type, it can be divided into two categories, namely the cation channel and the anion channel. This is closely related to the charge of the amino acid residues at the entrance and exit of each subunit unit. 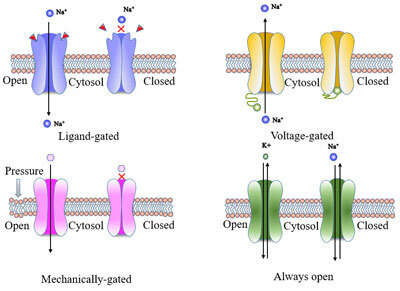 Voltage gated ion channels, also known as voltage dependent or voltage-sensitive ion channels, are gated and closed by sensing changes in membrane potential. There are four main types of ion channels: K+, Na+, Ca2+ and Cl- channels . This electrical activity is important for many processes in electrically excited cells such as neurons and muscles as well as in non-excited cells. Structure: Voltage-dependent ionic channel complexes are characterized by a single macromolecular polypeptide, each molecule containing four homologous repeat sequences, forming ion channels across membranes. Each repeating sequence unit contains 6 transmembrane segments. Ligand gated ion channels (or receptor gated channels) are known as chemical gated ion channels. The opening and closing of these ion channels are controlled by receptors coupled to the channels, which are the effectors that carry out the receptor function. Receptors belonging to this class: nicotinic acetylcholine receptor (nAchR)  , 5-HT3  , ionotropic glutamate , P2X receptor , glutamate receptor channel, aspartate receptor channel, γ-aminobutyric acid receptor (GABAR) , glycine receptors , etc. Structure: NAchR is one of the more clearly studied of these receptors. NAchR is a 5-molecule protein that is composed of 5 highly homologous subunits, including 2 alpha subunits, 1 beta subunit, 1 gamma subunit and 1 delta subunit, with ion channels in the middle. The binding site of this receptor is on two alpha subunits, which are located outside the membrane and have glycosylated sites. Mechanical force sensitive ion channels, also known as mechanical sensitivity ion channels. This ion channel opens when the cell is stimulated by various mechanical forces. According to the permeability, it can be divided into ion selectivity channel and non-ion selectivity channel. According to the function, it can be divided into tension activated ion channel and tension deactivated ion channel. The ion channel is regulated by the ion concentration of intracellular cGMP, cAMP. In addition, there are organelle ion channels, such as voltage dependent anion channels (VDACs), which are widely distributed on the outer membrane of mammalian cell mitochondria. Ryanodine receptor channel, IP3 receptor channel located on the sarcoplasmic reticulum (SR) or endoplasmic reticulum (ER) membrane. Ion channel is an important channel for cell metabolism and also an important component for maintaining the life activities of the body. Most essential mineral elements need to enter the cell through ion channels. The ion channel can maintain the relative balance of the osmotic pressure inside and outside the cell by adjusting the balance of the ion concentration inside and outside the cell and adjusting the water flow. Ion flow caused by ion channels often leads to local potential changes in the cell membrane. Animal vision, taste, olfactory formation, and perception of temperature are all related to changes in potential caused by ion channels. A new study has discovered the unique structure of gated ion channels in insects that are related to odors. It will only open when the receptor encounters the target odorant . The study provides ideas for preventing diseases transmitted by certain insects. For example, mosquito bites can spread serious diseases, including malaria, Zika virus and dengue fever. One way to prevent these diseases is to interfere with the ability of insects to sniff out human hosts. When the cells receive external stimuli, the ion channels open, causing the concentration of certain ions (Ca2+, K+, etc.) in the cytoplasm to rise rapidly, forming signal stimulation, further affecting the downstream signaling pathway. Definition: When a gene encoding an ion channel subunit is mutated/expressed abnormally or a pathological endogenous substance is present in the body, the function of the channel is weakened or enhanced to varying degrees, resulting in disorder of the overall physiological function of the body. Most channelopathy are not new, but previously we have not found that they have lesions at the ion channel level, such as myasthenia gravis, migraines, seizures, and so on . A large number of studies have found that some endogenous pathogenic substances (such as β-amyloid, β-amyloid precursor, presenilin-1, 2) may be present in patients with Alzheimer's disease (AD).It affects the structure and/or regulation process of potassium channel and calcium channel, and participates in the early memory loss and cognitive function decline of AD patients. Cerebral ischemia can affect the permeability of nerve cells by affecting calcium and sodium ion channels, resulting in acute osmotic swelling of nerve cells. The pathogenic factors of bronchial asthma act on the calcium channels on the cell membrane of mast cells, causing the opening of calcium ion channels, which activate the downstream signaling pathways through calcium ions, and ultimately lead to the release of histamine, leading to inflammatory reactions and asthma attacks. The structure and function of cellular ion channels are the basis of life-sustaining processes, and their genetic variation and dysfunction are related to the occurrence and development of many diseases, mainly involving the nervous system, muscles, heart, kidney and other systems and organs. The ion channel disease, which is well studied, mainly involves the fields of K+, Na+, Ca2+ and Cl- channels. Benign familial neonatal convulsions (BFNC), episodic ataxia type 1, paroxysmal choreoathetosis with episodic ataxia, epilepsy, Jervell and Lange-Nielsen syndrome, Andersen syndrome, etc. High-potassium type periodic paralysis, partially low-potassium type periodic paralysis, congenital accessory myotonia, 3-type long QT syndrome, 1-type pseudoaldosteronism, Liddle syndrome, generalized epilepsy with febrile seizures plus, etc. Calcium channels are involved in physiological processes of the nervous, muscular, secretory and reproductive systems. Calcium channel diseases have been found: familial hemiplegic migraine, hypokalemic periodic paralysis, 2-type episodic ataxia, 6-type spinal cerebellar ataxia, central core disease of muscle, malignant hyperthermia, etc. Excessive accumulation of calcium ions in smooth muscle cells is one of the important causes of bronchial asthma. The main functions of chloride channels are humoral transport, membrane potential and cellular immune responses. Chloride channel disease: congenital myotonia, recessive hereditary systemic myotonia, cystic fibrosis, hereditary kidney stone disease, 3-type Bartter syndrome. Gastric cancer is a highly aggressive and fatal malignancy that is also affected by chloride ion channels. Ion channel is an important regulator of apoptosis. Both ion channels and apoptosis dysfunction are associated with the occurrence, progression and chemotherapy resistance of tumors . Many pathological conditions, including cancer, viral infections and autoimmune diseases, are characterized by apoptotic damage, while other diseases, such as AIDS (acquired immune deficiency syndrome), osteoporosis and neurodegenerative diseases, have increased apoptotic rates. Studies have shown that potassium and calcium channels are involved in tumor angiogenesis, and sodium and chloride channels regulate tumor invasion and metastasis. Mutations in calcium channels or potassium (K+) channels can increase the incidence of craniofacial and limb defects .The same thing happens to fetuses .In addition, the destruction of the function of ion channels will also affect the morphogenesis of fish, frogs, mammals and flies. These results show that ion channels play a conservative role in the development process  . Studies have shown that ion channel expression disorders are associated with neurological, cardiovascular, immune disease and cancer pathogenesis. With the research on the structure and function of ion channels, ion channels have become an important target for drug design. Currently, ion channels (including ligand-gated ion channels) are the second largest target for existing drugs, second only to G-protein coupled receptors . K+ channels can be blocked by tetraethylamine (TEA), 4-aminopyridine, N' -tetraacetic acid (EGTA), quinidine and Ba2+. Drugs that block Na+ channel can be used in a wide range of membrane hyperexcitatory disorders, including arrhythmia, epilepsy, troponin and chronic pain. Drugs and toxins can be divided into 4 types depending on the different effect on Na+ channel. Channel blocker, such as tetrodotoxin (TTX), saxitoxin (STX). Channel activation enhancers, such as β-scorpion venom, arrow poison frog toxin (BTX), and cucurbitacin toxin (VER). Channel activation inhibitors, such as some local anesthetics and their derivatives. Channel inactivating inhibitors such as pronase, N-bromoacetamide (NBA), and the like. Drugs that block calcium channels can be used as antihypertensive and antiarrhythmic drugs, and are also widely used to treat ischemic epilepsy. Channel blocking or inhibitors: benzene alkyl amine, benzothiophene, dihydropyridine and other types. Non-selective blockers are piperazine, gabapentin and volatile anesthetics. Ca2+ channels can also be blocked by Ni2+, Cd2+, Co2+ and Mn2+ plasma. Channel activator: some bihydropyridine compounds such as BayK8644 and other drugs can activate Ca2+ channel. Joel A. Butterwick, Josefina del Mármol, Kelly H. Kim, et al. Cryo-EM structure of the insect olfactory receptor Orco [J]. Nature, 2018, 560: 447–452. Doyle D, Morais Cabral J, Pfuetzner RA, et al. The structure of the potassium channel: molecular basis of potassium conduction and selectivity [J]. Science, 1998, 280: 69–77. Dutzler R, Campbell E B, Cadene M, et al. X-ray structure of a ClC chloride channel at 3.0 A reveals the molecular basis of anion selectivity [J]. Nature, 2002, 415(6869): 287-294. Payandeh J J, Scheuer T T, Zheng N N, et al. 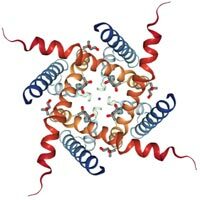 The crystal structure of a voltage-gated sodium channel [J]. Nature, 2011, 475(7356): 353-358. Hille, Bertil. Ionic Channels of Excitable Membranes [J]. Neurology, 1992, 42(7):1439-1439. Millar N S, Gotti C. Diversity of vertebrate nicotinic acetylcholine receptors [J]. Neuropharmacology, 2009, 56(1): 237-246. Changeux, Jean-Pierre. Allosteric Receptors: From Electric Organ to Cognition [J]. Annual Review of Pharmacology and Toxicology, 2010, 50(1): 1-38. Barnes N M, Hales T G, Lummis S C R, et al. The 5-HT3 receptor--the relationship between structure and function [J]. Neuropharmacology, 2009, 56(1): 273-284. Walstab J, Rappold G, Niesler B. 5-HT3 receptors: Role in disease and target of drugs [J]. Pharmacology & Therapeutics, 2010, 128(1): 146-169. Traynelis S F, Wollmuth L P, Mcbain C J, et al. Glutamate Receptor Ion Channels: Structure, Regulation, and Function [J]. Pharmacological Reviews, 2010, 62(3): 405-496. Surprenant A, North R A. Signaling at Purinergic P2X Receptors [J]. Annual Review of Physiology, 2009, 71(71): 333-359. Olsen R W, Sieghart W. International Union of Pharmacology. LXX. Subtypes of γ-Aminobutyric AcidA Receptors: Classification on the Basis of Subunit Composition, Pharmacology, and Function. Update [J]. Pharmacological Reviews, 2008, 60(3): 243-260. Yevenes G E, Zeilhofer H U. Allosteric modulation of glycine receptors [J]. British journal of pharmacology, 2011, 164(2): 224-236. Louis Ptáček. Ion Channel Diseases: Episodic Disorders of the Nervous System [J]. Seminars in Neurology, 1999, 19(04): 363-369. Davies N P, Hanna M G. Neurological channelopathies: diagnosis and therapy in the new millennium [J]. Annals of Medicine, 1999, 31(6): 15. Cotter T G. Apoptosis and cancer: the genesis of a research field [J]. Nature Reviews Cancer, 2009, 9(7): 501-7. Ramachandran K V, Hennessey J A, Barnett A S, et al. Calcium influx through L-type CaV1.2 Ca2+ channels regulates mandibular development [J]. Journal of Clinical Investigation, 2013, 123(4): 1638-1646. Daniel Mines, Patricia Tennis, Suellen M Curkendall, et al. Topiramate use in pregnancy and the birth prevalence of oral clefts [J]. Pharmacoepidemiology and Drug Safety, 2014, 23(10): 1017-1025. Dahal G R, Rawson J, Gassaway B, et al. An inwardly rectifying K+ channel is required for patterning [J]. Development, 2012, 139(19): 3653-3664. Pai V P, Aw S, Shomrat T, et al. Transmembrane voltage potential controls embryonic eye patterning in Xenopus laevis [J]. Development, 2012, 139(2): 313-23. Overington J P, Allazikani B, Hopkins A L. How many drug targets are there? [J]. Nature Reviews Drug Discovery, 2006, 5(12): 993-6.